Most of us are not typically motivated to rise with the sun and start the day with a workout. There are some big advantages though to incorporating morning workouts into your routine. 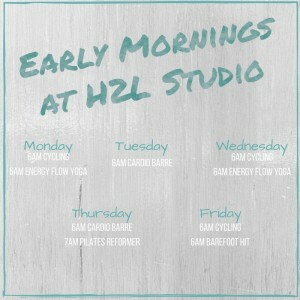 Maybe one of these will inspire you to set that alarm an hour early and come see us at the studio! Improves Your Mood. Okay we know that all exercise improves our mood by the body’s release of endorphins but research has shown that the greatest boost in mood occurs with morning workouts. This comes from the huge sense of accomplishment for starting the day in such a positive and healthy way. Promotes Improved Health: Again, no arguing, all exercise improves your health but early morning workouts have a unique advantage. By starting the day with a dose of exercise, you are much more likely to stay dedicated to other healthy choices. Early morning workouts also help fight those nasty food cravings. So if you are looking to make big improvements in your overall health, especially what you eat, start the day by working out. Boost To Your Metabolism: Regardless of the time of day, exercise will boost your metabolism. The morning workout has the added benefit of allowing you to burn more calories the rest of the day. This is known as the “afterburn effect” and is more noticeable with a regular morning fitness routine. 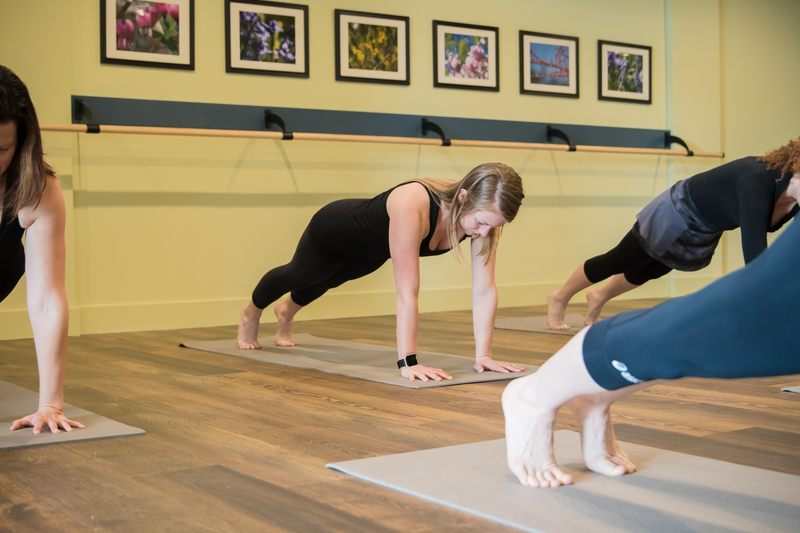 Frees Up Time In Your Day: By starting the day a little earlier with a morning workout, you are freeing up time later in the day for family or professional priorities. As our days progress, our to-do lists grow and stress levels increase with those demands. Move the workout to your morning routine and you have freed up valuable time later in the day. Increases Your Physical and Mental Energy: Skip the morning caffeine fix and head straight for the gym. Morning exercise is consistently shown to increase mental and physical energy levels. People who work out in the morning report feeling less tired throughout the day. Moving the body in this way early in the day also clears the mental fog associated with a morning routine lacking physical exercise. This gives us more clarity, creativity and focus throughout the day. Your Body Is At Its Peak: Hormones in our body that build muscle and burn fat are at their peak in the morning as we are waking. Morning exercise takes advantage of these peaked hormones which in return helps increase muscle mass and reduce more fat in the body than workouts later in the day. More Likely To Actually To Get It Done: It is much easier to stay committed to a workout early in the day vs. later in the day as the to-do list grows. Heck, if you accomplish nothing else the rest of the day, you will still feel great just for getting yourself up and working out. HUGE SENSE OF ACCOMPLISHMENT! So the next time you set the alarm for that 6 or 7am pilates or yoga class, don’t hit the snooze button! Just get up and get out the door. Every day it will get easier. As you feel more energy, a great sense of accomplishment, feel happier and stronger, you will easily want to rise with sun and exercise your way into a new day! 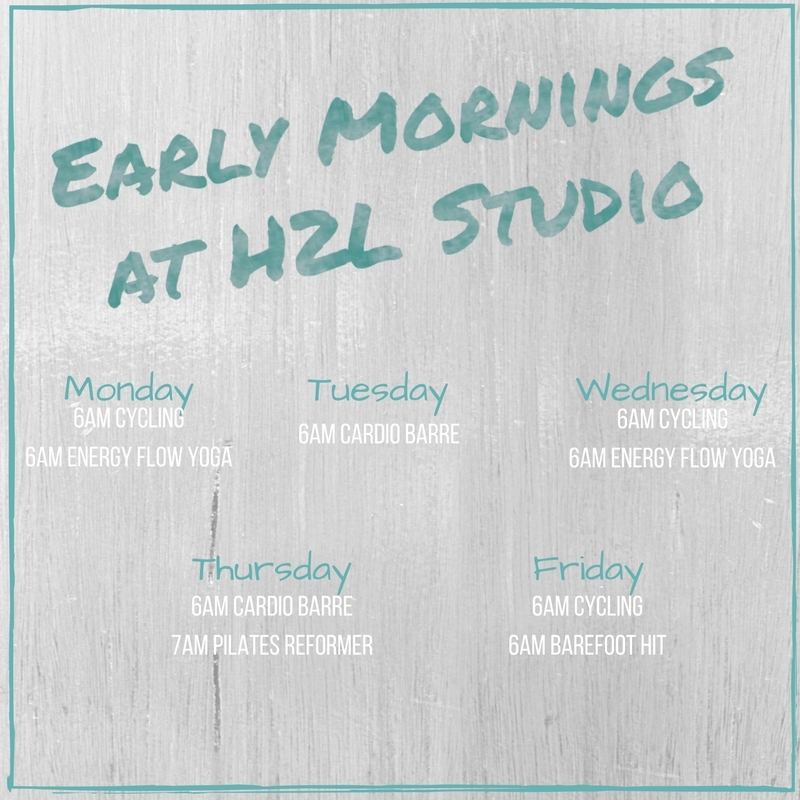 Here at H2L, we offer a variety of early morning group classes beginning at 6am, everything from Cycling (spinning), barre, Pilates, yoga and barefoot. Our instructors offer private instruction as early as 5am. 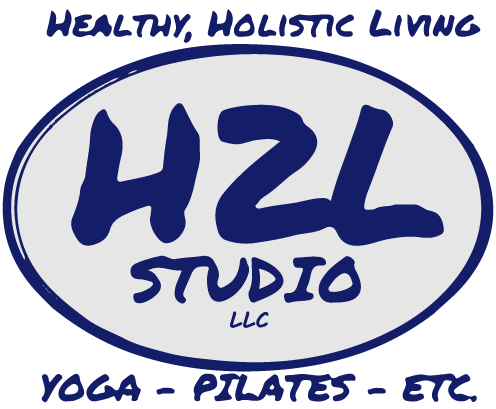 Sign up online for group classes or contact the studio to find out more about early morning private lessons.